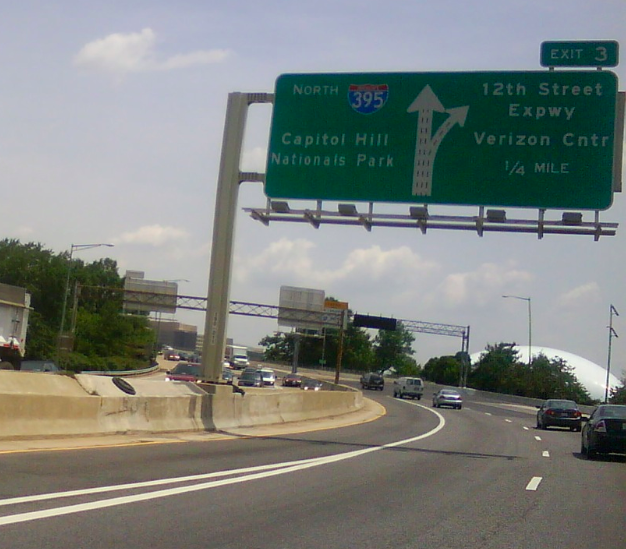 One of the things I have not talked about enough on this blog is the insane highway intersections common throughout DC. I think with that picture alone, a lot of people are groaning collectively. We've all been bitten by this, and probably more than once. There are only a few bridges across the Potomac into DC, and the 14th street gets you into central DC pretty quickly. 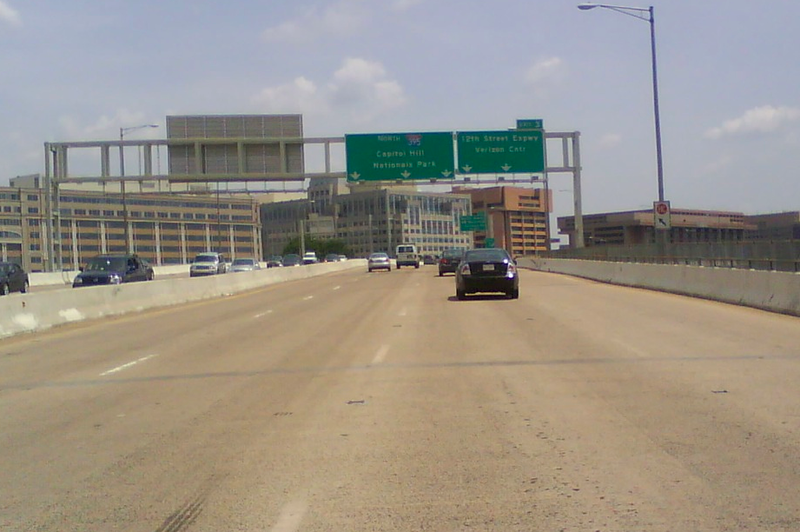 The problem is, the right-most lane of the 14th Street Bridge peels off to L'Enfant Plaza and 12th street, and hardly anybody ever takes that exit. It may have been a nice idea during the planning stages of the city -- to have this beautiful Promenade with shops and offices and a pretty view of the Washington Channel. But it didn't work out that way, and we're left with this enormous 2-lane exit to Nowheresville. 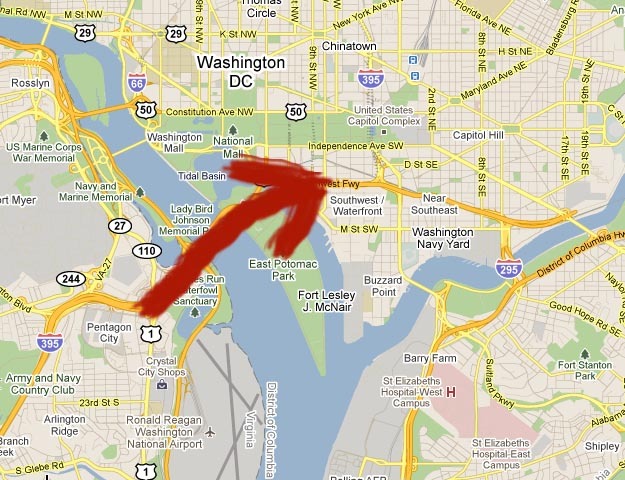 Neophytes to DC get nailed all the time. In the above picture, the right-most lane forces you off the highway (with no "EXIT ONLY" warning or anything) and the second-to-right lane gives you the option of taking the exit or not. 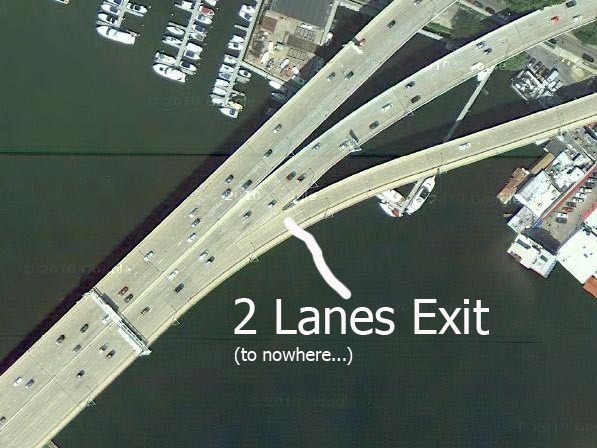 It's way, way more capacity than that exit needs. Or deserves. Every morning, you can count on 1 in 3 cars making a crazy, desperate maneuver to not get unceremoniously dumped onto L'Enfant Plaza and the promenade. And, perhaps once per week, you get a traffic-snarling accident here when someone's daring maneuver fails to account for the car in their blind spot.